COACCH (2018). 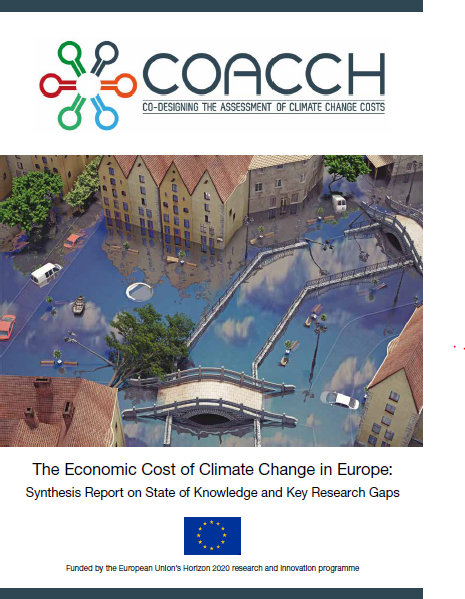 The Economic Cost of Climate Change in Europe: Synthesis Report on State of Knowledge and Key Research Gaps. Policy brief by the COACCH project. Editors: Paul Watkiss, Jenny Troeltzsch, Katriona McGlade. Published May , 2018. Jenny Troeltzsch, Katriona McGlade, Philipp Voss, John Tarpey, Katrina Abhold, Ecologic Institute. Daniel Lincke, Jochen Hinkel, Global Climate Forum. Ad Jeuken, Kees van Ginkel, Laurens Bouwer, Marjolijn Haasnoot, Deltares. Franceso Bosello, Enrica De Cian, CMCC. Paul Watkiss, Alistair Hunt, Federica Cimato, Michelle Watkiss, PWA. Andries Hof, Detlef van Vuuren, PBL.